Luiz Coelho is a candidate for Anglican priesthood works in the Parish of Christ the King in the City of God in Rio de Janeiro. The City of God is amongst the poorest and most violent slums in Rio. Luiz was also one of the Young Anglican Theologians that represented the Anglican Communion at Edinburgh 2010 and are currently finishing a book on Mission in the 3rd Millenium from an Anglican perspective. 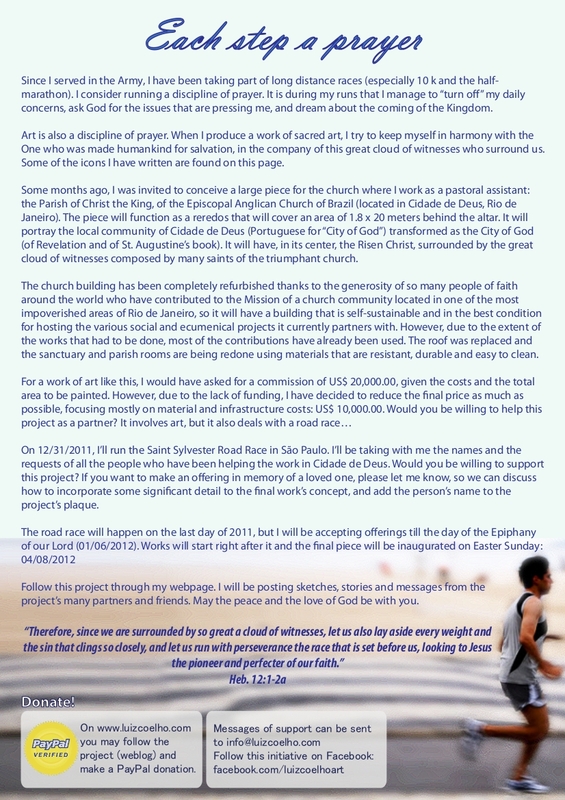 On the 31st, he will be running the Saint Sylvester Road Race, in São Paulo, as a means of raising funds for works at the Parish of Christ the King. Long distance running, for him, is also a discipline of prayer. His project will be crowned with the painting of a mural behind the church altar. The piece will function as a reredos that will cover an area of 1.8 x 20 meters behind the altar. It will portray the local community of Cidade de Deus (Portuguese for “City of God”) transformed as the City of God (of Revelation and of St. Augustine’s book). It will have, in its center, the Risen Christ, surrounded by the great cloud of witnesses composed by many saints of the triumphant church. He is seeking partners to help his project by promoting it on a website which gets constant updates with news stories about both his preparation for the race and the creation of the art piece. You can follow this adventure and become a sponsor by visiting the weblog at http://www.luizcoelho.com, the fanpage at http://www.facebook.com/luizcoelhoart and by following @passoseoracao on twitter. Click on the image below in order to enlarge the campaign poster and share it with friends and relatives. Luiz Coelho has worked as a volunteer at IEAB’s Provincial Offices for the last five years. In a very professional way, he has helped us move forward towards a new way of doing communication on the Internet. In my first visit to the Parish of Christ the King, I was able to learn more about Luiz’ pastoral and theological ministry, and especially his sacred art. His project aims to raise funds which will bring culture to the people of Cidade de Deus. It represents his creative and committed way of doing mission. “Each step a prayer” is one more step towards solidifying IEAB’s presence in a community so lacking of citizenship, rights and spirituality.